A Technician showed up the same day. We were very pleased that we could get service almost immediately to deal with a disgusting and distressing and expensive problem that seemed to pop up overnight. Unfortunately, there was damage to the wires in one of our car's engines that was parked in the garage. We had to have a mechanic replace wires and it cost a lot of money! We were relieved that Hearts Pest Management consultation was friendly and informative. We resolved our rat problem in the garage and we recommend Hearts Pest Management! Hearts Pest has been our service for 5 years and they have come through with keeping us comfortable and pest-free even at the times the ants would invade the house. They are the best! Friendly, options explained. Treatment successful. Jay provides a great service. He is friendly, knowledgable, and takes the time to address all of our questions. only been serviced twice....tech. is very knowledgeable. Am hopeful products will free us of the pesky bugs.****. I thought the technicians were great and things seem to be dying. Thank you. Hearts (Jay) provided the service I requested quickly and completely. I’m very happy. The representative who came to my house was on time, friendly, helpful and professional. Speedy response and appointment. We were overwhelmed with ants and needed help. Nothing was working and it needed to end. Next day Jay came out and after reviewing property and pests he was able to get rid of them. We haven’t seen an uninvited guest since. The fact that they care about the environment and don’t use harsh chemicals that can destroy the eco system really puts my mind at ease. We highly recommend Hearts. We had Heart's come out to rid our attic of rats and close off access. David set the traps throughout the attic, not just at the opening and then came out 3 different times that week to remove trapped rats. He was very knowledgeable and informed about how to best get rid of the problem. No more scratching sounds in our walls!! Hallelujah!! Amazing, fast service! Excellent technicians. Thank you Hearts! Always professional. Great work. Very responsive and knowledgeable. Have two houses serviced by Hearts and always top notch! friendly service and no ants. We've had a tricky case of tiny, relentless ants and David and the others at Hearts have been so gracious and generous in coming back and checking in to make sure the green treatments were effective. I so appreciate the warm customer service and follow-up—as well as the green option, which is why I called in the first place. I recommend Hearts highly! - Megan in Carlsbad, CA. We were very happy, but just today We just saw ants! We’re within thirty days. What do we need to do to get you out here again? Good service, friendly people, excellent response time. A repeat customer.... always good service. super pleased with service. gophers gone! We haven't had any ants since you treated our home. Happy they call prior to arrival giving me time to bring in the dogs. Pleasant, accommodating and flexible to work with! David was friendly and knowledgeable. Look forward to having our bug problems treated by a team of professionals. Always responsive, always professional and takes care of any pest problems we've had for over 10+ years! Thanks for your service! The tech is superb !!!1. 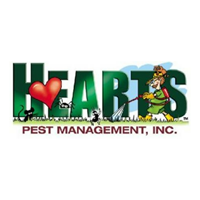 I have been satisfied with Hearts Pest Management. We usually do not have any problems with the little crawling things... and when we have had some problems, they have come out to specifically address anything we had problems with. The service personnel for Hearts are always polite, courteous & efficient. Really appreciate the care they take to ensure our pets are indoors during treatment.